The patient loved all his caregivers, but he considered dietician Stephanie Boyea his guardian angel. She helped him stop fearing his feeding tube. She readied him for his first sip of water by mouth in months. And she answered the question that most tormented him: When could he eat again? . A month before Christmas, Hector Gonzalez was already dreaming about holiday foods like tamales, pozole, and salted codfish. He was a big man, healthy and hardworking, with an appetite to match. But recently, sores on the roof of his mouth had made eating painful. He had lost almost 20 pounds. He went to a doctor to get medicine to clear things up. Instead, the doctor sent him to Winship Cancer Institute. Gonzalez was a little overwhelmed, but Winship oncologist Jonathon Cohen patiently explained his diagnosis so he could understand it. He had NK/T-cell lymphoma, a rare cancer that is often seen in the mouth. "We can treat it," Cohen said firmly. Gonzalez worried because he had just lost his job and also his health insurance, but Cohen and the Winship team were focused only on his need for treatment. Gonzalez trusted him, but being a patient was harder work than being an auto mechanic had ever been. He endured weeks of chemotherapy, radiation, and tests at every turn. The worst part was the feeding tube, in which he had to pour liquid formula several times a day. It terrified him—and it hurt. 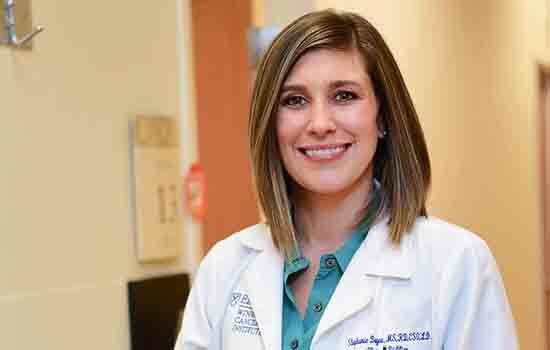 Dietitian Stephanie Boyea was at his side at every hospitalization and every clinic visit. She taught him a more comfortable way to load the tube. With insurance gone, she secured free formula for him. She encouraged him, joked with him, and gave him her direct phone number for consultation. Boyea says Gonzalez has been immensely grateful, for the months of care Emory provided, without charge, before he gained Medicaid coverage, and for the kindness of Dr. Cohen and his team. He never complained. The only thing he ever asked was when he would be able to eat again. Gonzalez finished radiation this past summer. Boyea promised, "When your mouth heals, you'll get a prosthesis to seal the holes left in your palate, the tube will come out, and you can eat. Yes, 'real food.'" He smiled broadly. It would be in time for Christmas.